IWM and DC Thomson Family History launch Lives Of The First World War website – creating a digital memorial celebrating the bravery of those who contributed to the WW1 effort in the Commonwealth. Back in February, the Imperial War Museums and DC Thomson Family History, tantalised the audience at Who Do You Think You Are? Live with their collaborative project – Lives Of The First World War. In the months since, the site has been open to Beta testing, and today finally saw the site go live to the general public at www.livesofthefirstworldwar.org. The idea of the project has been to build upon the records, and create a huge digital memorial that commemorates the lives of those who served in WW1 – whether they survived or lost their life. I’ve jumped straight in to add my great grandfather, Herbert Martin, who served with the Suffolk Regiment and the Northamptonshire Regiment as a Private, but was sadly crushed to death in a train accident in Boulogne, France, on 17th October 1917. 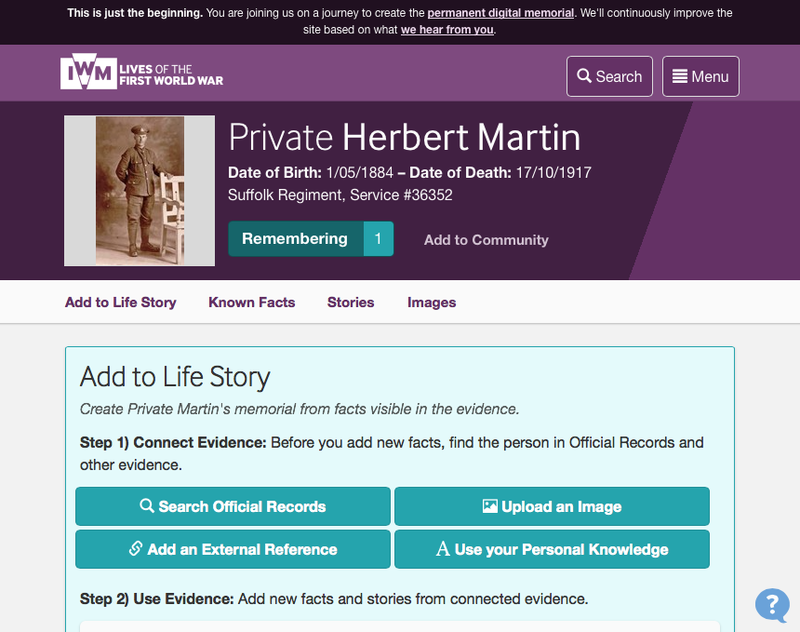 I’ve added my great grandfather to Lives Of The First World War. It’s a sad fact, that I have a lot of other brave people to begin adding, and that this will take some time, but the collaboration is seen as one that will provide an archive that will detail the social history of the 8 million men and women from the Commonwealth who contributed to the First World War effort. The site is clean and pretty easy to use. It’s also free, up to a point (you pay for access to some archive material), but you can add content yourself. You can also ‘remember’ any of the people listed – which kind of acts as a bookmark for you. The site also carries a message saying that they are aiming to keep updating it to add further features. I was keen to hear that there is an educational side to this site, and that the project is keen to see this site used as a school’s resource – in a bid to ensure that the service and bravery of our ancestors, is remembered for another 100 years. Remembrance of Private Herbert Martin, 1884-1917. 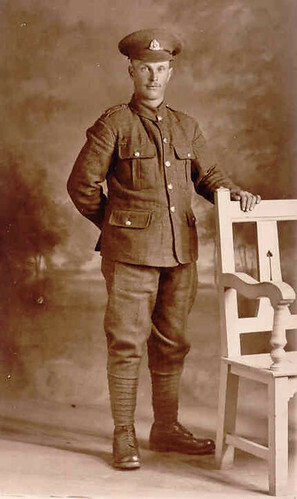 Herbert Martin (40572) enlisted as a Private of the 7th Battalion of the Northamptonshire Regiment. He was tragically killed on his way home towards the end of the First World War in a train accident in France. His name is featured on the Little Downham war memorial and was until recently also on a stone in the cemetery, along with his sister Emma and her husband John William Goodge. Herbert is named in the Cambridge Regiment’s instalment in St. George’s Chapel in Ely Cathedral, where it lists the names of the brave who died during the two world wars. 11th November was Armistice Day. It has now been 90 years since the First World War ended. A war that claimed the lives of around 20 million people. This means that it has been 91 years since the death of my Great Grandfather, Herbert Martin. He was a Private in the 7th Battalion of the Northamptonshire Regiment but was killed in a train accident in Boulogne, France on 17th October 1917. The Battalion landed in Boulogne in September 1915. He was 33 and a father of four sons, all under the age of 8yrs. His little brother Albert died the following year in Germany, apparently as a Prisoner of War in a coalmine (but that remains to be proven). He was just 19. His sister and brother-in-law, Emma and John Goodge also died during the War. This is just one part of my family that was touched by the First World War. Every single person lost someone and every family dreaded to hear that their husbands, fathers, brothers and sons would not be coming home again. I can’t begin to imagine what that must feel like, and I hope I never do. These were exceptionally brave men. Heroes. Thrown together into an impossible situation in which a large number of them didn’t stand a hope in surviving. I am immensely proud of my relatives who fought for their future – our future. There is seldom a day that passes where I don’t think about our brave men.